Students at Clifton Creek Primary School conducted a school/ community ANZAC ceremony on Friday 22nd of April. Students had been exploring the history, stories and impacts of Australia’s conflicts, particularly their first with the landing at Anzac Cove in 1915. 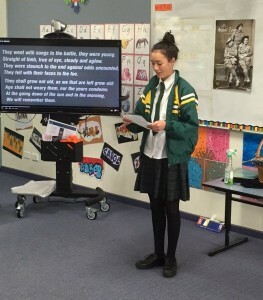 Former Clifton Creek student Angelina Clancy was the special guest speaker recounting her Spirit of Anzac project which saw her the proud recipient of The Premier’s Spirit of Anzac Award which resulted in her travel to the historical sites in Europe. 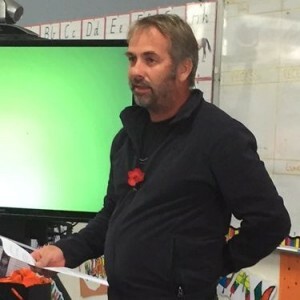 Every Clifton Creek student then contributed to an informative presentation which included short speeches on the Lone Pine, Poppies, Anzac biscuits, the Gallipoli experience , a quirky story of Maud Butler, the Last Post and the Slouch hat before senior students recited “And the Band Played Waltzing Matilda”. Staff member Dave Smythe gave an emotional account of the experiences of his Grandfather and father and the lifelong lessons they passed onto him. 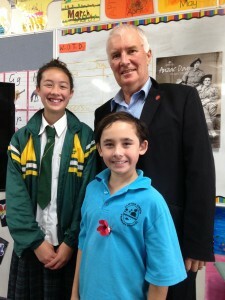 Students, staff and community members then participated in a formal Anzac Ceremony. Lest We Forget. 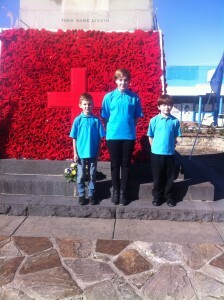 At the formal ANZAC ceremony in Bairnsdale on April 25th, our school was represented by Ashley, Jake and Mitchell. © 2010 Clifton Creek Primary School. All Rights Reserved.